Take your ideas further in York's 25 interdisciplinary research centres or through Innovation York, which will help you realize the social and commercial potential of your research. Choose from versatile programs that will enhance your knowledge and skills, giving you a competitive edge internationally. An international hub of research and knowledge in the heart of the greater Toronto area, offering teaching and learning support to all students. York’s Career Centre, as well as a host of other student services, will ensure your resumé reflects your readiness for a bright academic or professional future. Think beyond the ordinary to deliver the unexpected during your studies and beyond. To excel in your field, you need the strong foundation that comes from rigorous scholarship, the motivation that comes from passionate mentors, the stability that comes from solid academic and financial support, and the freedom that comes from diverse perspectives and plenty of room to think beyond conventions. At York University, you'll find your footing in a community of like-minded learners pushing the boundaries of knowledge to make excellence and equity matter in the wider world. Whether you love research or are looking for a competitive professional edge, we have options for you to explore. Build your skills, sharpen your insights, make an impact. 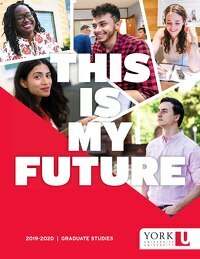 I consent to receive email from York University with relevant program information, admission updates, event invitations and dates/deadlines. * Voluntary declaration. Aboriginal people are persons who identify themselves as First Nation (status or non-Status), Métis or Inuit. Select your program(s) of interest.